I have been doing a lot of parts lately. Many new stuff will be done shortly. Rear brake air intake grilles, fiberglass bonnets etc. I worked today with my spotwelder mod. It will have external welding clamps bit pneumatic pinch. Its pretty much done now. Only the cables for welding current are missing. I actually think it will work in a day or two! See underpages for more. I had a problems updating the pages. I ran out of bandwidth and had to change the serverprovider. After that I was out of password and username to admin site for quite a lot of time.. The project has been moving forward all this time though. I have been investigating and making whole new parts. Masterswitch brackets, fuelpump brackets which are pretty rarely available. I also made diff front carrier, which I had a replica allready, but it was so poor condition that I made better. 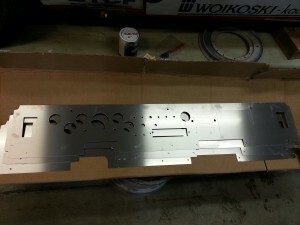 Now Im working on making the TCA front brackets (I have poor replicas of them too) and diff front carrier bodybrackets. Should have them done soon. For putting everything together I need to make a spotwelding clamp for my spotwelder. Then I can weld the parts like they were done at factory. I have it practicly done, just need a thread tap for making adapter for the electrode. Then I will start making the weldings. One of the greatest news is the new molds. I had a bodykit allready, but it was very poor quality. I was lucky and found 30 years old molds made from Finnish dealer team cars, they are made straight from works cars parts! Now Im repairing the molds to the shine they have been, mudguards are done and next job is to finish the bonnets. Small cracks and such need to be fixed first. Keep on looking. BTW, I have the adsense commercials now in the page. It wont hurt me if you click and look some of them. That helps me cover the extra expenses the rising traffic makes me pay. Have you noticed there are sub pages on “My g.4 project” page? Just point the “My g.4 project” and the sub page list opens. The project has been going forward since I started it. There has been slow motion period at summer 2013 cause I have been racing with my BMW. Now, the circuit race season is over and I have again started fast forward period 😉 Im still a bit stuck with some of my other to do things, but only in few days I get all extra cars away from my garage. Then I will go and bring the bodyshell back from a friend of mine who has been making it. Then we will start making the rust repairs. Im going to have big bunch of Yagmurs pieces from Turkey soon. Before those I will make some smaller repairs, there were some small rust holes that can be made from piece of sheet metal. After the larger pieces arrive the A-pillar renovation starts, also the winshield wiper panels will be new, as bottom of A-pillar where the door is mounted. The side kick panels are going to be changed completelly too. After all this is done, starts the g.4 steel pieces going in. After these have been welded on, the roll cage project starts. Luckily that is only a matter of money, there is good man for that around. Hopefully all this will be done before february. I hope the car has gloss black on at the time. Project goes on in time. Next major step is to strip the body. After this it will go to rollbar builder. Many parts are coming from all over the europe. I should have huge packages soon. In the meanwhile, I have been thinking what colours Im going to paint the car in to. I like the Alitalia look the most, but there are so many Alitalia painted cars. I will make it to look like one of the Flying Finns drew 131 Abarths, thats for sure. Alen is the greatest of them all driving 131. But, again, there are a lot of 131 with Alens name on it. I have been thinking one special painted car, I havent seen it ever after. Its a Timo Salonen´s car he drew in Quebec 1977. He won it with his co-pilot Markkula. What makes it so special is, it was painted in Alitalia colours in 1977, no other car I know wore Alitalia scheme before 1978. And thats not all. Propably cause the Oliofiat sponsorship was still on, the car had mixed painting with Oliofiat and Alitalia. This is what Im interested the most right now. Also, this particular car was destroyed 1977, so it would be nice to make one that doesnt exist anymore. Salonen at Quebec. Note the Alitalia livery on front bonnet, there is no Alitalia text and the green comes to very front. Also in front mudguard there is OLIOFIAT text and bottom of doors have different stickers too. The other I have been thinking is the old Finnish dealer team Autonovo colours. 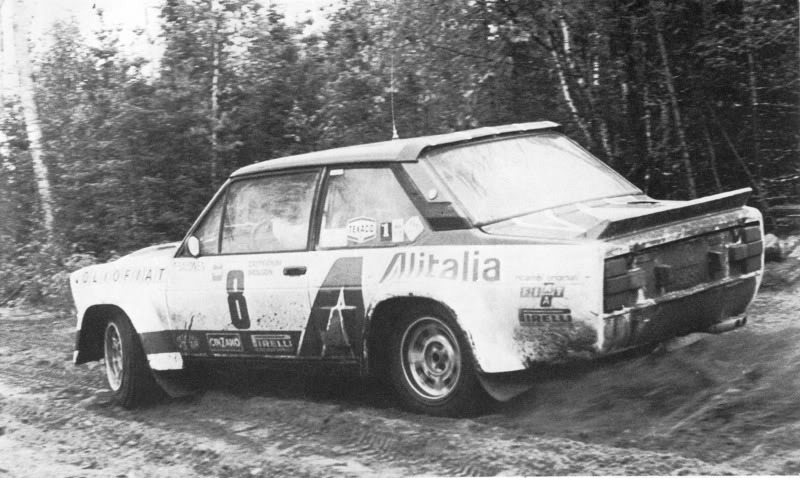 It was used a lot in Finland, and also one thousand lakes was won by Alen in Autonovo colours. 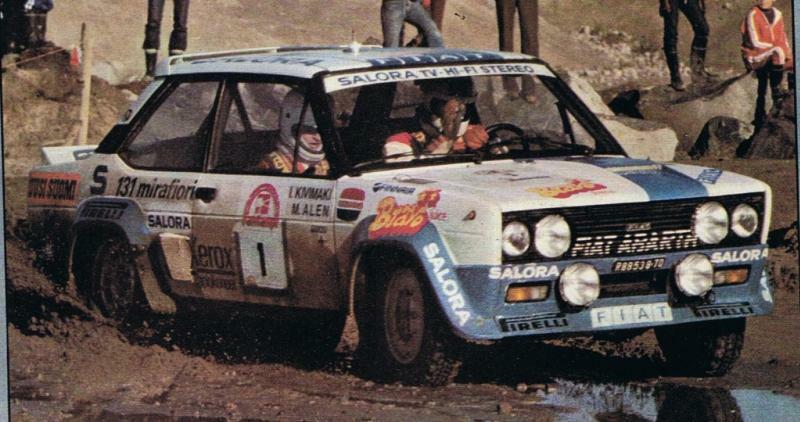 This is Alen 1980 winning the thousand lakes. All Autonovo cars had this same basic colours, blue on white. There were many different sponsor variations, and if I would make my car in these colours I would drop all local sponsors away and only the factory stickers would be left, like “131mirafiori” on sides and “Pirelli” on front. Those were in all cars. It has been a long live dream for me to have a Fiat 131 g.4 Rally Corsa. I have been dreaming to have it for twenty years. To have a original works car is beyond my wallet, but I can make a copy of it. 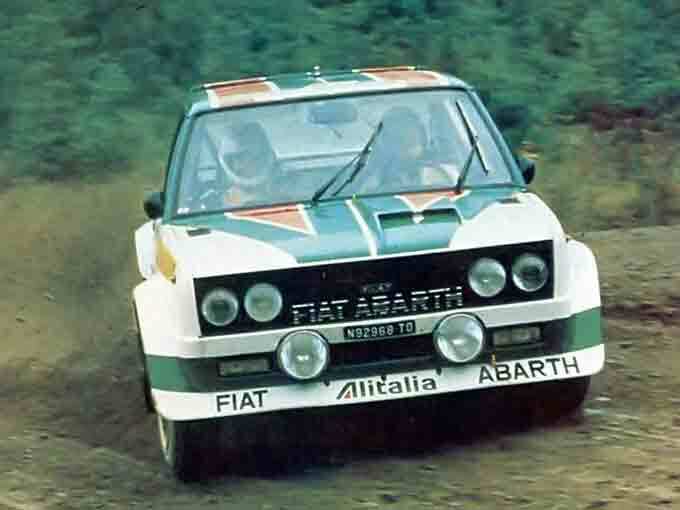 Having this 131 Abarth website helped me to find friends all over the world. I know a lot of people who are in to the g.4 131. Many of them have works cars by them selves, or they have built one. This helps me to build the car. Few has knowledge to build the g.4 in the level works team did them. I believe I am one of those people who can make it that way. This will be the story of the project. In this main page I will keep you informed of how the project goes on, the sub pages have more deep information of the areas they are for. The final kick to make the car came at summer 2012 when I was helping a fellow racer to build his historic rallycar to g.4. I noticed I really am still interested of the g.4. After all, I did have a 131 Racing from 1991 to 1995, and from 1995 to 2003 I had my 131 Rallycar. After that Ive been driving circuit races with BMW, so I have gained a lot of experience of how to build a good race car. We have been winning races with it, six hour and 24 hour encurance races. I started to collect parts first. I thought I dont need the body for the car first. I can collect some parts first, and after I have enough of them, I will then find a body to put them to. It seemed that I will be able to collect them faster I could believe. So, I had to find body also. I actually bought three cars before I found one so good I can really go for the project. First I started collecting parts for dashboard. I bought a dashboard from Italy, but it came badly damaged in the freight, so I had to make a better one. I also noticed that all the gauges were not in the places they should be. So, I made a better drawings and had it laser cut. I also bought the switches and warning lights. I found the correct fusebox too. From he first body I bought I got the -75 style heater and adjustments. At the moment Im missing the gauges, though I know where to get them.